Introduction: To assess the early outcomes of laparoscopic ventral hernia repair in the elderly. 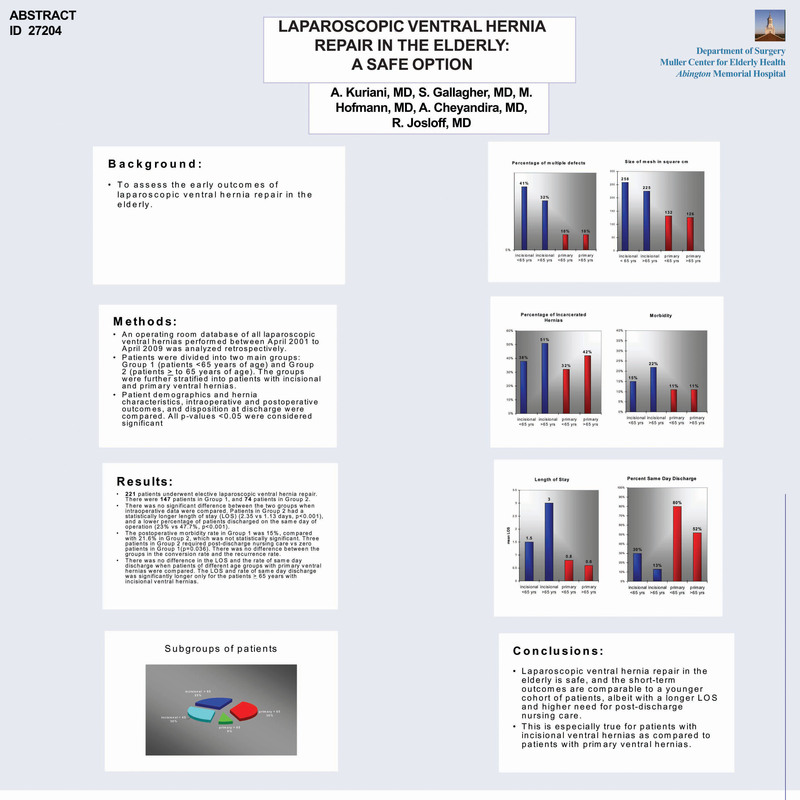 Methods and Procedures: An operating room database of all laparoscopic ventral hernias performed between April 2001 to April 2009 was analyzed retrospectively. Patients were divided into two main groups: Group 1 (patients <65 years of age) and Group 2 (patients > to 65 years of age). Patient demographics and hernia characteristics, intraoperative and postoperative outcomes, and disposition at discharge were compared. All p-values <0.05 were considered significant. Results: 221 patients underwent elective laparoscopic ventral hernia repair. There were 147 patients in Group 1, and 74 patients in Group 2. Group 2 had a higher percentage of incisional hernias (73% vs 45%, p < 0.0001). There was no significant difference between the two groups when intraoperative data were compared. Patients in Group 2 had a statistically longer length of stay (2.35 vs 1.13 days, p<0.001), and a lower percentage of patients discharged on the same day of operation (23% vs 47.7%, p<0.001). The postoperative morbidity rate in Group 1 was 15%, compared with 21.6% in Group2, which was not statistically significant. Three patients in Group 2 required post-discharge nursing care vs zero patients in Group 1(p=0.036). The overall conversion rate to open hernia repair of the entire cohort of patients was 5.8%. Then overall recurrence rate for both the groups was 1.3%, at a mean follow-up of 4 months. There was no difference between the groups in the conversion rate and the recurrence rate. Conclusions: Laparoscopic ventral hernia repair in the elderly is safe, and the short-term outcomes are comparable to a younger cohort of patients, albeit with a longer LOS and higher need for post-discharge nursing care.